This point in the calendar year prompts many of us educators into a state of reflective planning. When we stare accountability in the face and hold discussions about performance results, those results and subsequent discussions can weigh heavily on our hearts and minds. Some of us huddle into conference rooms with school leaders to disaggregate data, engage in data mining discussions, and develop plans. Eager teacher leaders sometimes abandon summer time set aside for their vacations and relaxation in order to join these leadership and planning discussions. The life of a dedicated educator is not futile. Sowing seeds of knowledge and encouragement are daily investments into the future. The arduous work of sowing seeds sometimes blinds us, sowers (teachers and school leaders in this case) from seeing fruits of our labor. When we are in the trenches of the education field, we sometimes think our sown seeds fall on arid ground. We are pleasantly surprised when a parent shows appreciation for our diligence and care to his or her child, a colleague notices our craft and passion in our respective roles, or that difficult student thanks us for a very important lesson we may have taught him or her. Whether or not we receive those rewards or appreciation, our job is to continue sowing consistently. The possibility of the small seed that we sow is endless. Touching the life of just one student impacts the lives of many. Life touches of that sort make actively educating worthwhile. Thus, futility cannot exist within this worthwhile work. No matter what term we use—disappointment, setback, letdown, hindrance, etc.—failure is what it is. As long as attempts exists, so will failure. Failure is inevitable for us educators because we are charged with discovering what works for the success of children. The complex and abstract concept of “what works” evades even the most seasoned and skilled educators. The path to finding what works varies from one individual school and child to the other and is difficult to define or even attain without encountering failure. Since we are dedicated educators, none of our failures are not fatal, for in those failed efforts dwell lessons. Therefore, our transparent leader-colleagues should openly share lessons gleaned about leadership with aspiring leaders and teachers whom they mentor. Our transparent teacher-colleagues should unapologetically display disappointments while thinking aloud regarding where to go from that lesson derived from failure. Failures birth lessons—lessons, about growth and development, lessons about being human, and lessons about life. As long as there is a willingness to start afresh, life is the successor to our failures and therefore curbs the potential fatality of them. What we do for the good of humanity is ever present throughout time. The worthwhile work of investing in people marks our stewardship of the future. Those deposits into the future outlive our physical presence; therefore, a physical end or career transition of any educator is not marked with finality. The sincerity and goodness of our worthwhile work not only “strikes a chord in eternity” (Warren, 2011), but they also follow us into the next phase of our lives, careers, and thereafter. 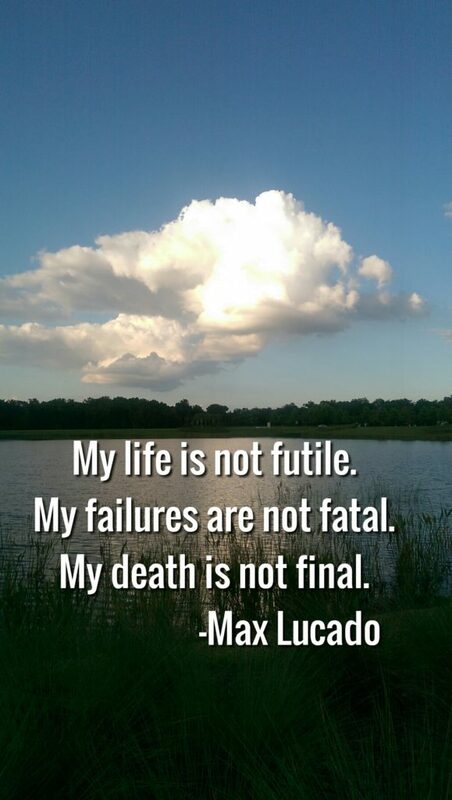 Our life is not futile. Our failures are not fatal. Our death is not final. Remembering these affirmational truths will keep us grounding and growing along our teaching and learning journey as educators. Lucado, M. (2006). Grace for the Moment, Volume II: More inspirational thoughts for each day of the year. Nashville, TN: Thomas Nelson. ISBN-13: 978-1404100978. Warren, R. (2011). The purpose-driven life: What on earth am I here for? Grand Rapids, MI. Zondervan. ISBN-13: 978-0310604037.